Furthermore, the problem facing working people in the U.S. is not just lack of jobs, but lack of good jobs. The loss of jobs at Carrier was such a blow to their local community because they were good, union jobs, paying $30 per hour and under a Steelworkers contract. If presidential bluster and tax cuts don’t produce good jobs, what does? The most obvious culprit in the loss of good jobs over the past several decades has been so-called “free trade.” The enactment of the North American Free Trade Agreement (NAFTA) and the establishment of the World Trade Organization (WTO) during the Clinton administration, and similar free trade agreements with Central America (CAFTA) and South Korea (KORUS FTA) negotiated during the George W. Bush administration, helped companies move hundreds of thousands of jobs to countries with lower wages, labor standards and environmental protections. In many of these countries, wages are low in part because right-wing governments have violently suppressed the labor movement, often with financial and military assistance from the U.S. government. Furthermore, companies have used the mere threat of relocation to defeat union organizing drives and extract concessions from organized workers. NAFTA and other free trade agreements have driven down the standard of living of U.S. workers not only through the direct loss of jobs, but because they have changed the balance of power between bosses and workers. While imposing tariffs on other countries may feel good after seeing corporations move so many jobs overseas, it will not bring jobs back to the U.S. Manufacturing industries that rely on steel, and will be hurt by the tariffs on imported steel, employ far more workers than steel-producing ones — by some estimates, as many as 80 times as many. The retaliatory tariffs imposed by Canada, the EU and China in response are already leading to layoffs. Most importantly, tariffs will not improve the low wages and poor working conditions of workers in Mexico, China, or anywhere else — the real reason corporations move jobs. What American workers need is not partial half-measures, but a trade and industrial policy that is based on international cooperation, respect for workers’ rights, and environmental sustainability — one that raises living standards for workers across industries and across borders through investment in infrastructure, jobs and social programs. Public investment and innovation policies that provide the basis for productivity growth — investing in the kind of infrastructure that has been demonstrated to be more effective in supporting small and medium manufacturing enterprises than the tax cuts favored by most politicians. A commitment to education and training, not only through investment in K-12 education and making college more accessible, but also in helping those who don’t get a college degree develop and maintain the skills necessary for a modern economy, including greater public support for apprenticeships, vocational education and sectoral training partnerships. Labor standards and social supports, including increasing the minimum wage, protecting workers’ legal rights to overtime pay, expanding workers’ right with new legislation on maximum hours and fair scheduling, and, most importantly, greater legal support for organizing and collective bargaining. Reviving the manufacturing sector is important, but manufacturing is not the only provider of good jobs. A study by David Cooper of the Economic Policy Institute looks at the economic performance of two similar Midwestern states, Wisconsin and Minnesota, to assess the overall impact of state-level policies on jobs, wages and benefits. They were also chosen because, since 2010, their governments have pursued different political agendas. Governor Scott Walker of Wisconsin came to national prominence in 2011 when his ultimately successful attempt to strip public-sector workers of collective bargaining rights provoked a weeks-long occupation of the state capitol building, but he and his Republican supporters in the state legislature have also pursued a host of other anti-worker policies, including passing a so-called “right to work” law, handing massive tax cuts to corporations, and cutting funding for public education and social services. In contrast, Minnesota’s Governor Mark Dayton has raised the minimum wage, supported workers’ rights to organize, and expanded unemployment insurance, access to paid sick days, and healthcare access. Together with a Democratic state legislature, he has raised taxes on the wealthy and used them to finance projects that benefit the common good, such as infrastructure, education, and aid to low-income families. From 2010 to 2017, Minnesota has had stronger overall economic growth than Wisconsin. The Congressional Progressive Caucus, in their “People’s Budget” for Fiscal Year 2019, have proposed exactly that. The People’s Budget calls for investing nearly $2 trillion (over ten years) in infrastructure, in order to “eliminate our lead-contaminated water system, address our overburdened mass transit system, and rebuild our schools, crumbling roads, and bridges.” The budget also “transforms our fossil-fuel energy system to ensure our children have an inhabitable planet, and provides funding for worker re-training and apprenticeship programs.” The Economic Policy Institute’s analysis of the People’s Budget estimates that, if enacted, it would create 1.8 million jobs. Considering the stronger storms, increased flooding, longer heat waves, crop damage, and sea level rise caused by global warming, delegates to UE’s 75th Convention last August demanded “massive investments by state and federal governments and U.S. businesses to convert to a clean-energy economy and create millions of good jobs in the process.” UE has joined a wide variety of labor, community, environmental and Indigenous organizations in demanding a “just transition,” one which guarantees that workers who are displaced from occupations like coal mining are guaranteed job training and new, good jobs in the renewable energy sector. The good news is that the transition to a clean-energy economy has the potential to not just replace jobs lost in fossil-fuel-based industries, but create far more new jobs. Transitioning to renewable energy, a cleaner transportation system, and a more energy-efficient built environment will require new manufacturing capacity to build equipment and vehicles, drivers and maintenance workers for expanded public transportation, and all sorts of workers in the building trades, as well as electricians, engineers, architects and technicians. Various UE allies have put forward concrete, workable plans to achieve this. The Off Fossil Fuels Act introduced by Congresswoman Tulsi Gabbard, and endorsed in June by UE’s General Executive Board, would cut greenhouse gas emissions by 80 percent while creating jobs in the renewable energy sector, establishing clear pathways for renewable energy workers to exercise their right to join and organize a union, and providing wage and benefit protection and job training for workers in the fossil fuel industry. Working with economist Frank Ackerman, the Labor Network for Sustainability and the environmentalist group 350.org have put together a “Clean Energy Future” plan that would cut greenhouse gas emissions by 80 percent by 2050, while creating half a million jobs, primarily in manufacturing and construction. The Clean Energy Future plan focuses on transforming the electric system, creating jobs in energy efficiency programs, renewable energy production, and auto manufacturing (making electric cars). In addition, by providing savings to working people in the form of lowered energy costs, the Clean Energy Future stimulates the economy as a whole. Trade unionists in Great Britain have laid out an even more ambitious plan for 1.5 million climate jobs, while cutting their country’s CO2 emissions by 86 percent. The Campaign Against Climate Change Trade Union Working Group’s 2014 plan proposes to establish a National Climate Service that would directly create one million jobs in renewable energy, transport, and construction. They estimate that this would generate a further 500,000 jobs at the companies that would manufacture products and provide services to the National Climate Service. A similar plan in the U.S., whose economy is more than seven times the size of Great Britain’s, could easily yield ten million new jobs. Crucial to a just transition to a clean energy future is a policy initially demanded by UE members in the 1970s, and now given greater urgency by the climate crisis: public ownership of the energy industry. Trade Unions for Energy Democracy, of which UE is a member, states in their working paper “Preparing a Public Pathway” (2017) that “only a planned, coordinated, publicly driven approach to investment [in renewable energy] has a credible chance of delivering the dramatically scaled up deployment of renewable power that we urgently need.” Only public ownership can protect a successful transition to renewable energy — necessary for our very survival as a species — from the caprices and whims of private profit-chasing owners, of the kind that have subjected so many UE families and communities to disruption and dislocation from layoffs and plant closings over the past half-century. As UE members know from long experience, employers — even those who are accountable to voters or the members of cooperatively-owned businesses — do not create good jobs out of the goodness of their hearts. In order to ensure that job-creating policies translate into real improvements in working people’s standard of living, collective bargaining is absolutely necessary. Extensive research backs this up. A May 2018 study by four economists, looking at newly-available data on union membership, demonstrates that high rates of unionization during the 1950s and 60s were crucial to the lower rates of economic inequality during that period, and that the benefits of unionization were especially important for women and people of color. Collective bargaining … plays a critical role that is hard, if not impossible, to replicate. Collective bargaining directly gives workers power to negotiate for better working conditions. Other policy solutions increase worker power indirectly, meaning that their ability to raise wages depends on an additional course of action that may not always take place. As an example of “courses of action that may not always take place,” Madland explains that while tighter labor markets in theory provide individual workers greater “bargaining power” with their employers, that depends on workers being willing to constantly “shop around” for new jobs. Eliminating “right to work” laws, strengthening protections for workers who are organizing a union in their workplace, and protecting the collective bargaining rights of public-sector workers in every state are therefore all critical parts of a program to create good jobs. The Workplace Democracy Act, introduced by Senator Bernie Sanders in May, would achieve many of these goals. However, Madland goes further and suggests that, in order to effectively bring the benefits of collective bargaining to all workers, the government should create “wage boards” that would bring together employer and worker representatives, under government supervision, to set wage floors across entire industries. In the 1940s, when 100 percent of GE and Westinghouse workers were organized by UE, unions were able to use the U.S. system of “firm-level” bargaining to set patterns across entire industries. However, decades of structural changes in the economy, contracting-out and moving work to non-union locations, and flat-out union-busting have reduced the effectiveness of firm-level bargaining, and few if any unions have the power to set wages for an entire industry. Firm-level bargaining has become even less effective in recent years as companies have contracted out work and directly employed fewer people. As firms’ structures change, workers often have trouble negotiating with the firm that is actually in charge and increasingly risk receiving lower pay and losing benefits when their employer changes. Wage boards would also provide the benefits of collective bargaining to workers who cannot effectively engage in “firm-level” bargaining under the National Labor Relations Act, either because they work in industries dominated by small workplaces (such as fast food or domestic work), or are considered “independent contractors” (such as taxi and ride-share drivers). Organizations like the National Domestic Workers Alliance and the New York Taxi Workers Alliance have had some success in raising wages and setting labor standards for domestic workers and taxi and ride-share drivers through legislation at the city and state level, a good precedent for establishing formal wage boards in those industries. Former CWA President Larry Cohen, who currently chairs the board of Our Revolution and addressed UE’s most recent convention, endorsed the idea of sectoral bargaining in an article in New Labor Forum, and pointed to the recent teacher strikes as an example. “Rather than negotiating with each school district, teachers in the four states with strikes, at least to some extent, and with varying results, were able to negotiate statewide, not only on key issues affecting them but also on state funding of education.” Matt Bruenig of the People’s Policy Project has argued that sectoral bargaining is the “One Big Idea” that can effectively solve unemployment. Building the political will to enact a bold jobs program will be a challenge — but UE members can look to our own history for examples that were far bolder than what is being put forward by politicians and most unions today, and were nearly successful. Historian Rosemary Feurer’s book about UE District 8, Radical Unionism in the Midwest, 1900-1950 (University of Illinois Press, 2006), describes how District 8 leaders engaged the broader community in forward-thinking programs for jobs before and after World War II, as conversion to and from war production threatened economic dislocation. District 8 was based in St. Louis and encompassed Missouri, Iowa, Kansas, Arkansas, southern Indiana and southern and western Illinois. As the U.S. government began mobilizing for the war in 1941, the policy of awarding defense contracts overwhelmingly to large corporations, combined with restricted production of consumer goods, threatened to devastate the small- and medium-sized manufacturers who employed the bulk of District 8’s membership. After Pearl Harbor, the vast increase in war contracts, combined with the tighter labor market created by so many working people joining the military, lessened the urgency of combating unemployment. Sentner’s vision of expanding this grassroots, community-based approach to economic planning for jobs was never taken up nationally by the labor movement, as he had hoped. Nonetheless, the prestige of the successful Priority Unemployment Plan helped UE win representation elections in Evansville during the war, and as the war wound down, Sentner and other District 8 leaders revived their models of community-based jobs campaigns to address the far greater challenge of post-war conversion back to a peacetime economy. 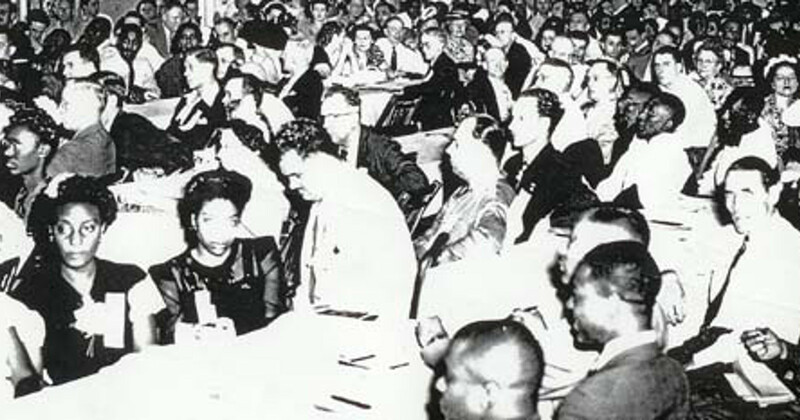 In 1944, District 8 held five conferences on “Community Leadership for Reconversion and Postwar Employment” throughout the district. Two men and two women were elected from each factory department in UE shops to discuss what UE members thought the post-war economy should look like, and guests were invited from government, churches, community organizations, and African-American and women’s groups. Conference attendees not only demanded government planning to guarantee continued high levels of employment after the war ended, they also contested the notion — widely promoted by employers — that the large numbers of women who began working in factories during the war wanted to give up their jobs after the war. Instead, UE members demanded the provision of nurseries and other forms of assistance so that women who wanted to raise a family could continue to work, as almost all UE women in attendance at the conferences expressed as desire to do. UE District 8 members combined their demands for good jobs with a forward-thinking environmental vision in one of the most visionary labor campaigns in American history, the campaign to establish a Missouri Valley Authority. In 1944, the Missouri River flooded dramatically, causing over $110 million in damage and prompting calls for government action to control flooding. Various corporate interests and government bureaucracies saw this as an opportunity to propose “flood control” plans that would massively re-engineer the natural river. The U.S. Army Corps of Engineers, close to shipping interests, proposed making the river deeper in order to accommodate navigation, while the Bureau of Reclamation proposed an additional series of dams and reservoirs to provide irrigation to corporate agribusinesses operating in the upper part of the valley. UE saw this as an opportunity to instead put forward a plan that would address both economic and environmental concerns, and would bring together working people, farmers and small businesses throughout the region. Drawing on the popularity of the Tennessee Valley Authority, UE District 8 produced a pamphlet called One River, One Plan, calling for the creation of a Missouri Valley Authority (MVA) which would have broad authority to engage in economic and environmental planning for the region. Half a million jobs would be created directly through irrigation, electrification, soil conservation and reforestation projects, with the MVA employing workers directly at union wages. Widespread electrification would create demand for products made by UE members, boosting employment as war contracts ended. Flood control through soil conservation and reforestation — rather than massive geo-engineering projects — would address the concerns of small farmers and rural communities throughout the region. President Roosevelt proposed creating other river-based planning authorities in the 30s, but was stymied by corporate opposition to such “socialistic” schemes. UE proposed to counter corporate influence with a broad community campaign that would unite labor, farmers and consumers. Legislation to create the MVA was introduced in August 1944. The idea was endorsed and prioritized by the national CIO, as well as by AFL and building trades bodies throughout the region. The 250,000-member National Farmers Union enthusiastically embraced the idea and used the UE pamphlet as an organizing tool. The MVA also won support from the Cooperative League, whose two million members advocated for public power, and the Consumers Cooperative Association. President Roosevelt endorsed the MVA, and a summer 1945 poll indicated that 75 percent of people living in the Missouri Valley supported the project. Despite such a groundswell of support, corporate forces were ultimately successful in derailing the MVA and preventing its passage. The Army Corps of Engineers and Bureau of Reclamation hastily merged their proposals into what became the Pick-Sloan Flood Control Act of 1944, allowing opponents to claim that the MVA wasn’t necessary. Opponents also engaged in the same red-baiting used against UE in this period, claiming that the proposal was “socialistic” and “un-American,” even going so far as to produce an anti-MVA pamphlet called “Totalitarianism on the March.” Meanwhile, red-baiting attacks against Sentner and other leaders of District 8 meant that UE — by far the largest CIO union in St. Louis, and the key leader of the diverse coalition supporting the MVA — was increasingly consumed with defending our very existence. The defeat of the MVA was not only a loss to the working people of the region. The Pick-Sloan Act led to the seizure and flooding of over 200,000 acres of Native-owned land (over 20 percent of the land requisitioned for flood-control projects throughout the valley), and the displacement of over 1,500 Native Americans. The dam and reservoir projects favored by Pick-Sloan over soil conservation eliminated the millions of cubic feet of silt the Missouri had previously dumped into the Mississippi. The lack of this silt led, by the 1990s, to the disappearance of barrier islands in Louisiana, contributing directly to the destructiveness of Hurricane Katrina in 2005. The MVA proposal was a vision of a democratic economy. It sought to improve the lives of working people through the creation of an entity that was publicly owned, and accountable to an advisory body made up of representatives from labor, farmer, business and citizens’ groups. Its purpose was not to create profit, but to meet the needs of the people and communities of the Missouri Valley. And its proponents envisioned that, through widespread unionization, workers would have a high degree of control over their workplace — something District 8 shops had been militant about during the war, as they won cases at the National War Labor Board that management saw as demanding a share in “managerial functions,” and engaged in community-based campaigns to force employers to hire more African-American workers. The U.S. faces an increasing income and wealth gap. The proportion of wealth held by the top 0.1 percent is almost as great as in the late 1920s prior to the Great Depression. Since 1980, the average income of the top one hundredth of percent more than quadrupled, while the bottom 90 percent had no change after inflation. During our current period of “recovery” 95 percent of all growth of has gone to the top 1 percent. The policy further declares that “[f]undamental political changes are needed to reverse this massive inequality of wealth.” Activists, policy experts and pro-worker politicians are increasingly putting forward projects and proposals to make the economy more democratic, by promoting alternative models of ownership, pursuing purposes other than profit, and increasing worker control over the workplace. The predominance of private property ownership has led to a lack of long-term investment and declining rates of productivity, undermined democracy, left regions of the country economically forgotten, and contributed to increasing levels of inequality and financial insecurity. Alternative forms of ownership can fundamentally address these problems. Bruenig, of the People’s Policy Project, has proposed a national social wealth fund, modeled on similar (and successful) funds in Norway and Alaska. The social wealth fund would be collectively owned by the American people, and could be used to both provide social benefits and exercise democratic control over the companies that it invests in. In Cincinnati, the Cincinnati Union Co-op Initiative is developing the infrastructure to build a family of unionized worker cooperatives, with several already in existence and more in various stages of developments. These cooperatives — like the UE worker co-ops New Era Windows in Chicago and Collective Copies in Western Massachusetts — are owned by their workers (or, in the case of a neighborhood grocery store currently in development, co-owned by workers and consumers). They serve socially useful purposes like providing healthy food, child care, and renewable energy. And the workers — even those who have not become owners yet — are guaranteed a voice in their workplace through their unions. UE District 8’s Missouri Valley Authority proposal could easily be revived and modernized, and combined with elements of the British proposal for a National Climate Service. A network of regional Just Transition Authorities, publicly owned and accountable to communities and workers, could be set up to address the specific carbon-reduction and employment needs of different regions of the country.